The RHS spring sports season has gotten underway this week after two weeks of preseason preparations. The line-up this year of spring sports teams includes boys and girls tennis, boys and girls lacrosse, boys and girls track along with baseball and softball. 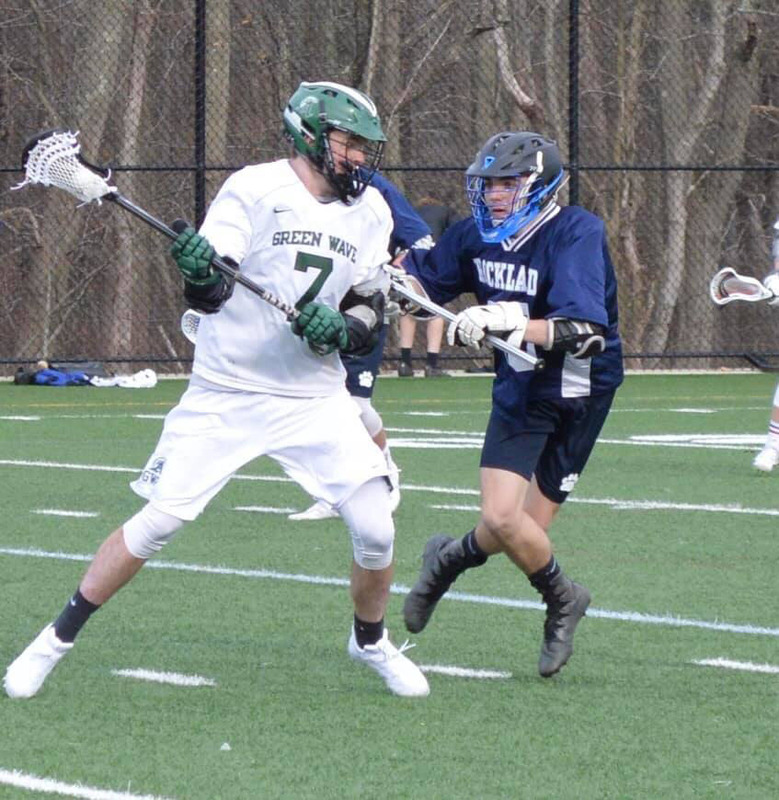 On Tuesday, April 2, the lacrosse teams both opened up against the Abington Green Wave in Abington and both were successful. The boys came away with a 16-4 win while the girls outscored Abington 17-10. For the girls Maddie Blonde had six goals and one assist. 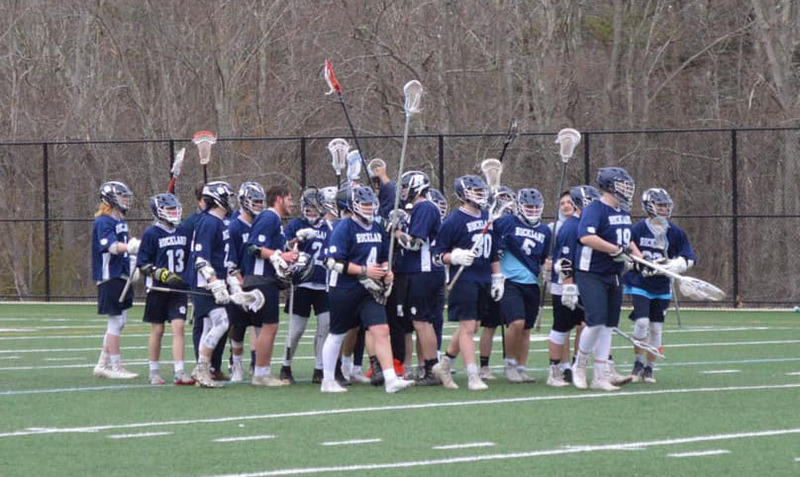 The lacrosse teams will be back at it on Friday against Archbishop Williams. Also on Tuesday the baseball team traveled to Pembroke. They were not as fortunate as the lacrosse teams, losing to Pembroke 3-1. The Dogs got solid pitching from Declan Rogers and Robert Ivil. Cullen Rogers scored the run with a double and Ricky Glavin’s RBI single. The softball team traveled to Whitman-Hanson on Thursday after a rain-out on Wednesday. They came up with the win 9-4. Michaela Bruno went 4 for 4, with a hit and 3 doubles. On the mound she pitched 7 innings, allowing 5hits and striking out 7. Macy Grass went 2 for 3 and Shannon Murphy had a 3 run home run. They will be playing Plymouth-North tomorrow (Friday). The boys and girls tennis teams went against Randolph on Thursday. The boys won 5-0 and the girls got the win 4-1. Both teams play Mashpee tomorrow (Friday). The RHS girls tennis team will be going up against Randolph tomorrow. photo from RHS Girls Tennis twitter. The track teams will have their first meet next week on Weds. April 10 at Abington against Cohasset/Hull. The track teams always have to play away because Rockland does not have a suitable track for meets. Good luck to all the teams as they begin their seasons. Here’s hoping the weather gets a little warmer! 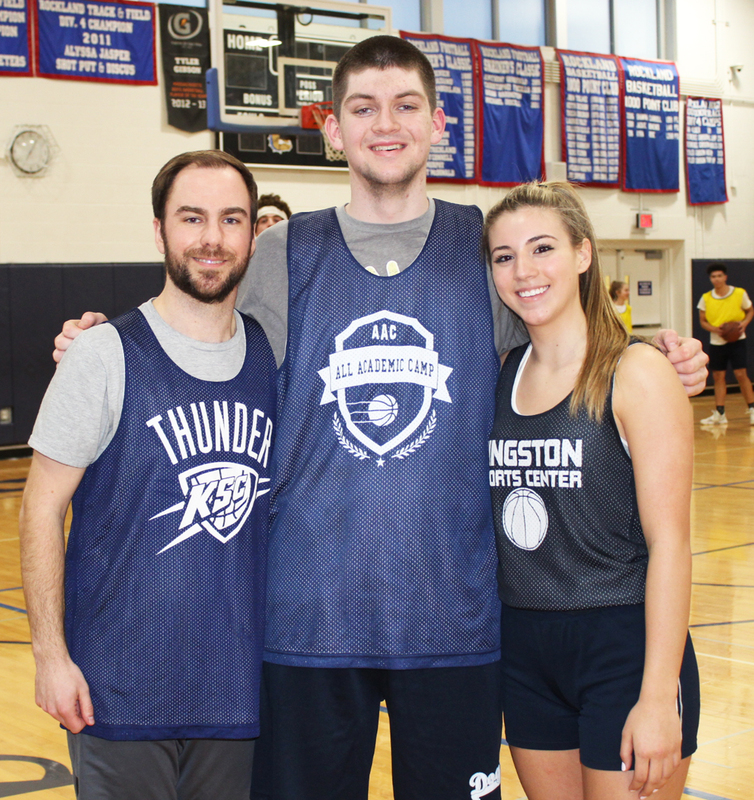 In their first time competing, Triple Threat, a team made up of guidance counselor Chris DeVine, senior John Ellard, and athletic trainer Emily Gray, captured the 2019 Nets for Nets three-on-three basketball tournament championship. 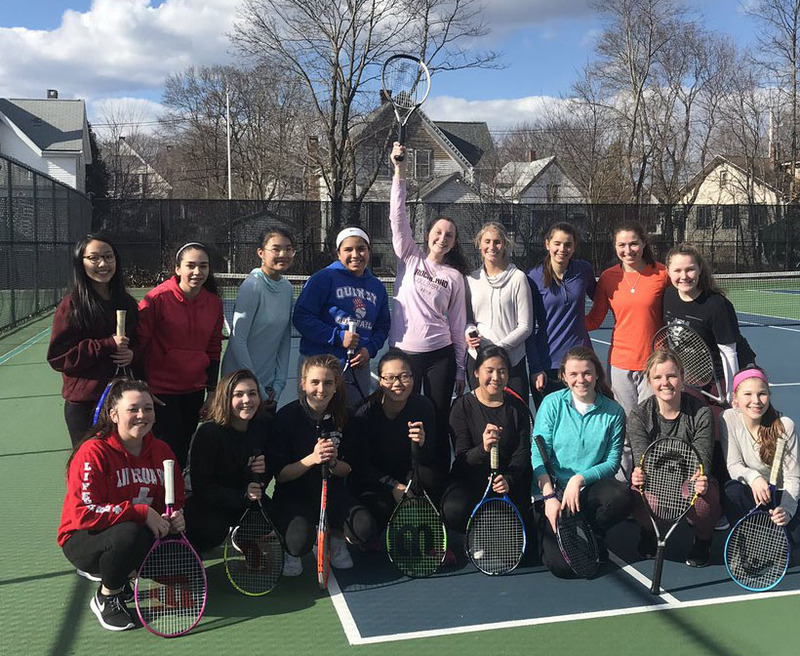 The tournament, held on March 19, is an annual Student Government sponsored event that raises money for the charity, Nothing But Nets, an organization that provides bed nets for families in Africa. Sixteen teams competed for the coveted golden basketball trophy with Triple Threat defeating the Kekambas in the finals. The Kekambas, a team made up of Transitions teacher, Dan Kimball, junior Hannah Murphy, and junior Derek Williams, assured everyone that they would be back next year for the rematch. 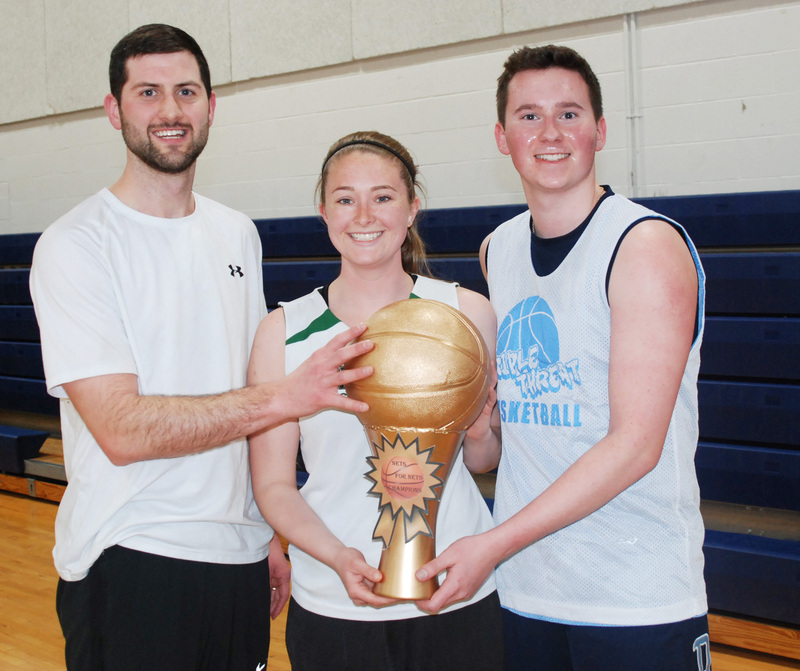 Last year’s championship team, Three-Peat, featuring physical education teacher Mike Doyle was unseated partially due to an injury to junior girls basketball all-star, Caroline Elie, that kept her out of playing. Her sister, 7th grader Maggie, did a great job filling in. Also on the squad was Aneuris Quezada. 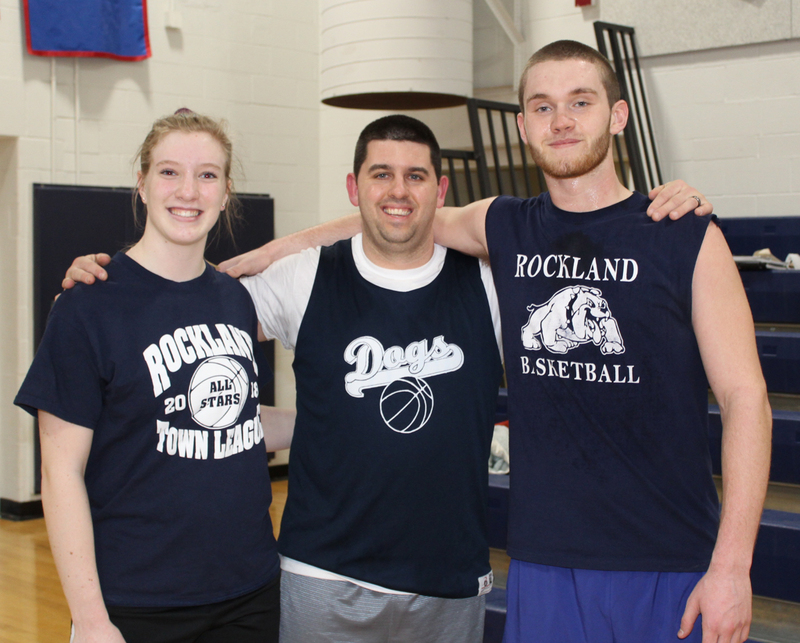 Losing in the semifinals to the Kekambas was the Bulldogs, that included senior Ashley Murphy, junior Dante Vasquez and Rogers Middle School teacher, Matthew Vincenzi. Principal John Harrison’s team, the Green Eagles, included junior girls basketball all-star, Hannah Wyllie. They had their very creative t-shirts designed and made by teammate Anthony DiNino. It was a fun way to get a little March Madness into the high school scene and also to raise money for a good cause. Each of the sixteen teams contributed a $15 entry fee. Joanne White and Jill Delaney, Student Government advisors kept track of the brackets and awarded the golden basketball trophy to the winners. Junior Katie Buckley, Community Services Committee Chair, organized the tournament for the SGC. Ms. White said that she was pleased at the turnout of teams and thought the tournament was a great success. Mrs. Armstrong along with Matt Bruzzese and Zach Webb. Tres Amigos: Eric Barber, Kyle Lenihan and Mrs. Shaughnessy. Joanne White and Jill Delaney kept the brackets. Maggie Elie takes a shot. Mr. Harrison gets rebounding position on Reese Quezada. Mr. Harrison takes a jump shot. Dan Kimball, Hannah Murphy and Derrick Williams took second place honors. The Bulldogs: Dante Vasquez, Ashley Murphy and Mr. Vincenzi. The RHS Cheerleaders won the State Championship on March 10. From left, back row: Natalia Roosa, Arianna Dutton, Bella Seaton, Haley Benson, Gianna Gervasi, Riley Taylor and Rebecca Keefe. Middle row: Calin Monett, Liv Campbell, Tori Crowley, Katie Fitzgerald, Lindsay Tsiantoulas, and Katie Keefe. Front: Hallie Molineaux, Bella Burns and Mia Comeau. It was a long day this past Sunday (March 10) at Tantasqua Regional High School but the Rockland High School cheerleaders performed a “flawless routine” according to asst. coach Kim Reardon and came away with another, back to back, MSAA State Championship in Division 4. 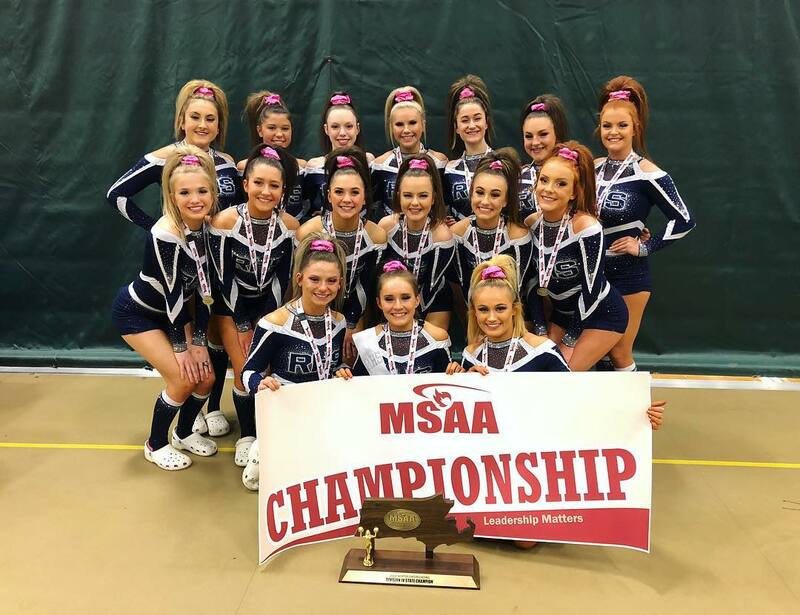 On March 3, the cheerleaders had competed in the Division 4 South Regionals in Natick, and to no one’s surprise placed first, giving them another shot at the State Championship on Sunday. For senior Bella Burns, this is her sixth State Championship in four years. The cheerleaders have been so successful that many forget how hard they work to perfect their routines. Athletic Director Gary Graziano said that the girls are successful because despite the fact that cheerleading is not considered a “sport,” the girls work as hard as any RHS athletes for their team’s success. Mrs. Reardon also credits the girls’ work ethic, their pride and commitment, and the support they have received from numerous people. Assistant coaches are Kim Reardon and Krystin Killion with Tyler Lewis’ additional support. Now it’s on to the New England Championships next Saturday, March 16 at Worcester State University. They will be competing during the second session. If you haven’t seen these girls compete maybe you should! You have one more chance! Coaches and cheerleaders after their win. Caroline Elie, Mr. Doyle and Zach Sharland won the tournament last year. The Rockland High School Student Government Council will once again be hosting the Nets for Nets tournament. This year the tournament will be on Tuesday, March 19. The tournament is a popular one that started in 2016. Nets for Nets is a 3 on 3 basketball tournament comprised of teams made up of teachers and students. Each team is required to have at least one female player AND one faculty or staff member (a female teacher counts as both). Sign-ups are being held now. To sign up you need to get a sheet from Ms. White’s room (205), and sign up your team. The money raised is donated to Nothing But Nets, an organization that provides bed nets for families in Africa. The nets keep out mosquitoes that transmit malaria in warm climates. According to the group, every two minutes somewhere in the world, a child dies from malaria. For more about the organization and what they do, go here. Hurry and sign up to help this worthy cause and have fun at the same time. Slots are filling up fast! Senior Ashley Murphy had a great game and got a tournament win on Thursday night against Bishop Stang. The most exciting time of the year for RHS athletic teams was in full swing this week as the boys’ and girls’ basketball teams and the hockey team began tournament play. Two out of the three teams were able to win their opening games and will play again on Friday night (Hockey) and Saturday afternoon (Girls Basketball). Tournament games began on Tuesday night as the boys’ basketball team traveled to Old Rochester to open up their Division 3 South tournament bid while the boys’ hockey team stayed home to take on Middleboro/Hull in a preliminary round of the D3 South tournament. The RHS Boys’ Basketball Team and Old Rochester both had 11-9 records as they entered the seeding, but ORR won the tie-breaker and got the #8 seed, meaning that Rockland would have to travel as the #9 seed. The closeness of their records though hinted at how close the game would be, as ORR with the home court advantage, pulled off a one point win, 54-53, thus ending the boys’ season. The take-away though is still a plus for the boys’ basketball team that ended the regular season with four straight wins, including an exciting tournament championship in the Shawn P. Cotter tournament in Abington during February vacation. All but one of those late season wins were needed to qualify for tournament, an outcome that seemed all but impossible early on in the season. Hunter Wardwell and Tyrae Worrell led the scoring with 13 points apiece. Seniors Rashaad Jean, Dan Callahan, Peter Kohler, Mike Ebersole, Anthony DeCecco and Worrell ended their careers with the Bulldogs. The RHS Hockey Team had an even closer game as they opened up tournament play at home. This was a preliminary game as Rockland, seeded 14th with a record of 11-8-1, had a preliminary round, play-in game with #19 Middleboro/Hull. M/H’s record of 9-8-3 included two losses to the Bulldogs during the regular season. Regular season records though are not important when it comes to tournament and the game’s back and forth play was punctuated by terrific goaltending at both ends. Rockland’s Tom McSweeney had 30 saves and Middleboro’s goalie probably played his best game of the year, turning aside many of Rockland’s scoring chances. However, senior captain, Evan Gormley led Rockland, scoring two goals, including the overtime winner, and adding an assist. Also contributing for Rockland in addition to McSweeney and Gormley were 8th grader,Joey Salamone with one goal and sophomore Nick Blonde with two assists. Student fans in black-out clothing were in full force at the Rockland Rink and spectators were three deep and wall-to-wall surrounding the rink. The hockey team will go for a first round win on Friday at the Canton Ice House at 6:30. They will take on #3 see No. Quincy. The Girls’ Basketball Team opened its tournament play on Wednesday night at home against Bishop Stang High School. The girls with a record of 14-6 are seeded #5 and Bishop Stang got the #12 seed with a record of 12-8 going in. The girls got off to a quick start, but then the offense and defense sputtered. This allowing Stang to hang in and the Lady Dogs only took a 2 point lead (19-17) into the locker room at half-time. The second half was a different story as the defense tightened thanks to great efforts from senior Maddie Blonde and junior Hannah Murphy. The Lady Dogs only allowed Stang two third quarter points and seven 2nd half points in all for a 55-33 win. Caroline Elie, Ashley Murphy, Hannah Wyllie and Julia Elie took care of the scoring with Caroline Elie leading the way with 16 points. Ashley Murphy, Wyllie and Elie chipped in with double figures as well and the two Elies and Wyllie also recorded double figures in rebounding. Fans dressed in white-out also provided a spark for the girls in their second half outburst. Now the girls will play in a quarterfinal round on Saturday at 4 pm in Norwell. Norwell (the #4 seed) and Rockland split their two league games with Norwell taking the first game in early January in Rockland and Rockland countering in Norwell with an exciting one point win. It should be a great game on Saturday. Each of the winter sports teams had successful seasons, and three teams are now preparing for their postseason tournaments. Each of the teams honored their seniors on their senior nights and below are links to a page of photos for each of the senior nights. Veritas photographer Ashley Murphy took photos of the seniors on the wrestling and hockey teams. Girls Basketball photos were taken by Janet Guenet and Chris Burnieika and Mr. Graziano provided Boys Basketball and Swimming photos. Congratulations to all the seniors who participated in RHS Winter Sports! Click on any of the group photos to go to the individual photo gallery. Nicole Blonde, Ashley Murphy and Maddie Blonde on senior night. Photo courtesy of Janet Guenet. Cheerleading captain and senior Bella Burns.